Today's earrings are a little different. I call them "Midnite Sparkle". I made me a pair just like these and I get soooo many compliments off of these. The number one question about these earring "Are they heavy?". No they aren't because the round balls with the little rhinestones are acrylic (plastic). I love them. Hoping you will too! These are my lovely earrings for the day...Butterflies in Coral (that name may not stick). I really like Vintaj brass, they have some awesome pieces. Checkout the monthly special click here! WOW! No one entered my drawing to win these beautiful heart earrings. I'm bumped about that! :( But oh well another day, another time and another giveaway next week maybe! Today's earrings are hearts that I wire-wrapped with black wire and hung Swarovski crystals hearts from one side of the larger wire heart. Yet another pair of flowers! Are you tired of FLOWERS? I'm not lol! But I will take a break over the next coming days from the floral boutique I have created. Before we move on...this pair of earrings are Lucite golden roses and this time I paired them with green and silver, instead of the purple and gunmetal. PS. Don't forget the drawing tomorrow. I'm giving away a pair of earrings! Today's pair of earrings are yet another pair of flowers in blue again. These are similar to the black pair I made and displayed with three other pair of earrings. I can't tell you how much fun I'm having making these earrings of flowers. The colors are so bold and bright; blue, green, pink, red, black & white, so fun, so pretty! My new shipment of the latest Lucite beads came today. I had three orders from 3 different vendors over the weekend. I sat down and made five pair of earrings tonight with gold findings. I'll post those next week. If you have been keeping up with me you want to stay tuned for Thursday. I plan to giveaway a pair of earrings. So leave a comment here on my blog, tell about my giveaway on your blog, facebook and/ or twitter. Do all four things and you could win the pair that I post on Thursday. You must post a comment here on this post. This is a mystery earring giveaway, not even I know what I'm giving away just yet. Please leave your comments on this post for Thursday, winner will be revealed Friday! Today's pair of earrings are also made of glass but a different type of mold/ design then my previous pairs of earrings that I've made so far. Did I mention I love flowers...I was playing I do! I still used the hoop finding and just wrapped the beads around the hoop, added a Bali silver bead cap and another frosted round glass bead. I then made Swarovski crystal dangles with sterling silver bead caps and hung them from gunmetal ear wires. I still partying and going around hitting the blogs that I didnt for the Bead Soup Blog Party so click here to view mine. I made two pair of earrings today, both will constitue as #78. 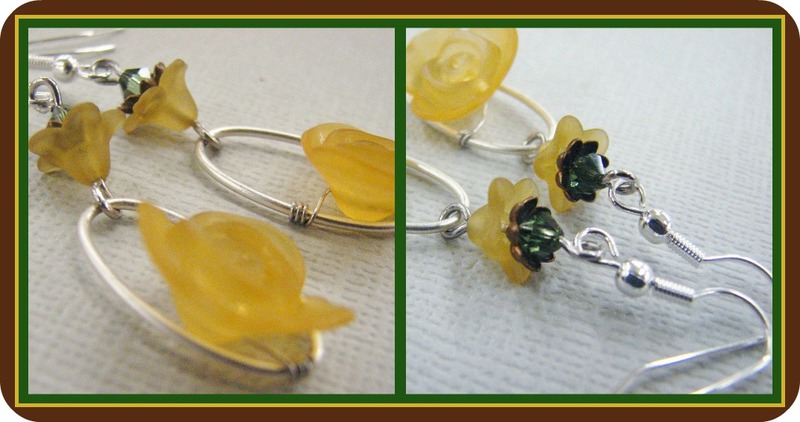 Each earring has a focal flower made of glass, wire-wrapped on a chain link. The orange pair is on a satin finish link in gold and the aqua pair is wrapped on a gunmetal finished link. Trendy Flower Earrings in Aqua and Pink have three small Lucite flowers that dangle from the end, each pink has a aqua Swarovski crystal inset and the blue has a pink glass inset. These are finished with a pink textured glass pearl. All metal is gunmetal. Trendy Flower Earrings in Orange have three dangles made of cat's eye (glass) and Swarovski crystals. These are finished with a orange cat's eye as well and all metal is gold-filled.